While bike theft statistics in the UK remain largely static, there are still 100,000 cases reported every year. Bicycles are attractive to thieves because bike parts are easy to sell and to scrap. Though not all bikes are high value, their accessibility is what makes them easy targets for thieves – they are left unguarded for long periods of time, especially in places like schools and universities. Thefts often occur whilst the owners are attending classes. This is why bicycle shelters in the UK play an important role in preventing bike theft. On top of protecting the bicycle from the elements, they also provide an extra layer of protection from would-be thieves. The design of your bicycle shelter plays a big part in the safety of your shelter. To prevent theft, you need a durable shelter with solid parking rack that will not budge even if placed under a lot of stress. A looped, bolted down design prevents bike chains from slipping and minimises the chances of vandalism and tampering. At Kensington, our shelters are made from lightweight yet durable materials, which can withstand the elements and tampering. We can customise your design as needed, including creating shelters designed for smaller bicycles for the use of young students, or even racks for scooters. In places where bikes will likely be left for a longer period of time, consider installing a lockable cycle compound instead. Cycle compounds are covered from both sides and allow limited access to the bicycles as it allows you to lock up the entire structure. This is ideal for schools – you can keep the bike racks locked during school hours, and then open it up for the students once classes for the day end. Lockable cycle compounds add an additional layer of protection from theft. Kensington produces custom bike racks, including lockable cycle compounds. You can even put two shelters together if you prefer – since they are modular, they are easy to reconfigure to meet your needs. The use of clear roofing for bike shelters is not just an aesthetic choice – it can minimise suspicious behaviour too. Thieves will often utilise blind spots while stealing bikes – the use of clear roofing eliminates these blind spots for you can always see if someone is standing there. Even frosted roofing is preferable to completely opaque roofs, as you can still see through them with ease. When planning where to place your cycle shelter, considering choosing a strategic location. Bike shelters should be accessible to the ones using them, but still be out of the way of foot traffic. The shelter should be easy to see at all times – cycle shelters that are out of sight and hidden away are more likely to attract thieves. By carefully planning your cycle shelter’s design and location, you can greatly minimise incidents of bike theft. Kensington not only provides bike shelters, we can also help you with your canopy and blinds needs. You’ll find it refreshingly easy dealing with just one professional team instead of having to go to separate specialists. Are you in need of beautiful, secure bike shelters for your construction project? 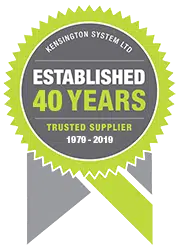 Contact Kensington today to learn more.